Also see "Centres with stupas" on the menu bar. Please let me know if your centre has a stupa under construction not listed here. The projects goal is the reconstruction of all the stupas in Asia: Tibet, China, Nepal, Bhutan, Mongolia, Ladakh, India, Sri Lanka, etc. The number of abandoned and/or ruined stupas in Asia is estimated to be of about 24,000. The project aims to repair all these stupas with the help of local craftsmen. It also aims to help the development of these areas by promoting cultural tourism, local schools, and medical and hygienic services. 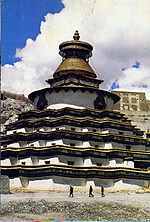 This site has many, many photos of old stupas in Ladakh etc. Levels: 13 levels with tens of thousands of various sized stupas up to a total of 100,000 stupas". Spain I was recently sent these photos of a very large stupa under construction in Southern Spain high on a hill overlooking the Mediterranean just outside the village of Benalmadena.Thanks to several people, here is the home page for this amazing project. There are many pictures of the construction. Karma Choling Where Trungpa Rinpoche started in North America, and where he was cremated. Stupa to be started soon. Samye Ling and Holy Island. Sedona, Arizona "Kunzang Palyul Chöling, Tibetan Buddhist centers in the Nyingma tradition, under the spiritual direction of Jetsunma Ahkön Lhamo with locations in Sedona, Arizona and Poolesville, Maryland. There are 26 stupas at the Poolesville temple. Foundation for the Preservation of the Mahayana Tradition There are over 100 centres around the world. many have stupas (see Gyantse next). Another example is Land of Medice Buddha, where they are in the initial stages of Building 100,000 Stupas on the land in Soquel, California. There will be one 40 foot stupa and many other 6' plus stupas and thousands more of various Stupas adding up to 100,000. They will be built on terraced land fashioned after Borabobur. Chenrezig Institute Garden of Enlightenment. These pages are a Yahoo group, there is a lot of information here, but you have to find it. Look under "files" on the left. For instance, the sub folder "stupa information" contains many more files. Also "photos" - there are three different albums, and the middle one has lots of photos of the stupa garden. Gyantse New pages about the "same-size" reproduction is to be built in Bendigo, Australia. "It is about 50 metres square at its base and rises to almost 50 metres high".Site, floor and section plans available to view. A great site! Charlottesville Stupa Construction of the stupa at Samchen Ch�ling in Charlottesville, Virginia, began in February, 2000. Photos here. This is a BIG stupa! Really great slide show of the construction. Stupa pages in Oslo, Norway. This page has links to other stupa sites (not working last time I checked) .No English, but never fear: In case you didn't know, Altavista will translate. Also see here for a world first - follow the construction of a stone stupa in Germany on Facebook! Here, in New Zealand, there are now quite a few stupas. There are finished ones in Dunedin, Wangapeka and Karma Choeling (north of Auckland). There are more underway at Stokes Valley, (near Wellington), Christchurch, Coromandel and Auckland city. The basic structure of six more has just been completed at Karma Choeling. Here is a page that has links to the stupas I've helped build in New Zealand and Australia.